A book is a collection of sheets of paper, parchment or other material, bound together along one edge within covers. A book is also a literary work or a main division of such a work. A book produced in electronic format is known as an e-book. Serial publications such as magazines, journals or newspapers are normally not called books. 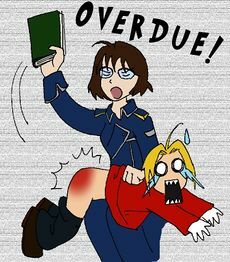 Fullmetal Alchemist fanart Sheska spanking Ed being overdue with his library books. There are spanking novels and instructional spanking literature printed in book form. For other (i.e. mainstream) books with spanking references, see spanking in literature. There are also spanking scenes in mainstream comics and manga. A special trick of schoolboys was to stuff a book in the seat of their trousers if they knew or feared they were going to be caned on that day. The book would protect them from feeling the cane while they would pretend to be in pain. However this trick was often discovered by the teacher, resulting in the instant removal of the book and, probably in most cases, extra punishment for attempting the racket. The book trick would also be sure to fail if the punishment was a bare bottom spanking. An occasional scene uses books as an pervertible implement, normally as an improvised tool in an on-the-spot spanking and occasionally as a humorous reason; for example the book is book on Child Psychology with an anti-spanking leaning. In spanking videos, books are sometimes used as implements or are otherwise incorporated into disciplinary scenarios. For example, schoolgirls sometimes have to hold a stack of books at arm's length for a specific period of time – and are punished if they fail. Europe Airlines, Episode 14: Posture Training (Spanked In Uniform), includes book-on-head balance deportment training of a stewardess. Friday the 13th (Lupus Pictures), two girls have to kneel while holding out books (balanced on their knuckles, see photo) as part of a long series of humiliations. Laura Gets Soundly Spanked for Not Returning Books (Real Life Spanking, photo), girl spanked while holding up heavy books. The Punishment Book (Shadow Lane), featuring real life couple Lizzie Madison and David Pearl, takes a different approach. Here, Lizzie has to keep a journal recording all punishments for her misdeeds so that she may learn to do better. The Punishment of Penny (distributed by Pure Spanking), UK video in which a uniformed schoolgirl has to hold out her arms with a book in each hand. Sorority Hell Night (London Enterprises), pledge Kiri Kelly has to balance a book on her head. Spanked to Tears (Pacific Force), girl gets deportment training (balancing a book on her head) and punished by kneeling naked for 20 minutes holding out a heavy book in each hand. Two Girls ... Two Exams (Girls Boarding School), girls hold books at arm's length as punishment. bedtime story a F/f spanking on Anime OTK by smallmew. Indoor Voices, Please a F/m spanking on Anime OTK. School spanking a M/m spanking an Anime OTK by Ruka. This page uses content from Wikipedia. The original article was at Book. The list of authors can be seen in the page history. As with Spanking Art, the text of Wikipedia is available under a copyleft license, the Creative Commons Attribution Sharealike license.